How to receive audio description? You can access audio descriptions on a variety of devices including but not limited to cable TV, Amazon Fire TV and tablets, and TiVo. Because there are many devices, there is no single standardized method for receiving description. However, most systems depend on the concept of a “Second Audio Program,” or SAP, which is now defunct and all that’s left of it is its name. Some devices are easier than others, but at some point, you might need to call your local cable or satellite provider for help. Please go forward and file a complaint with the FCC if they didn’t respond or refused to help. Major TV channels such as ABC, CBS, NBC, Fox, USA, the Disney Channel, and The History Channel are required by law to provide 50 hours of audio descriptions, and that will increase to 87.5 hours by July 2018. Local stations, satellite providers, and cable companies are also obligated to provide audio-described prime time or children’s programming per calendar quarter. The audio description on TV is somewhat entangled due to unclear law and rules. Interestingly, a group of blind individuals took AMC theatres to court in light of poor audio description service. They won the case, and AMC is now obligated to provide top service to blind and low vision people. Is audio description available on Netflix? Mostly yes, audio description is downloadable for most Netflix original titles, and other handpicked movies and TV shows. Soon audio descriptions will be available for more shows and on more devices. 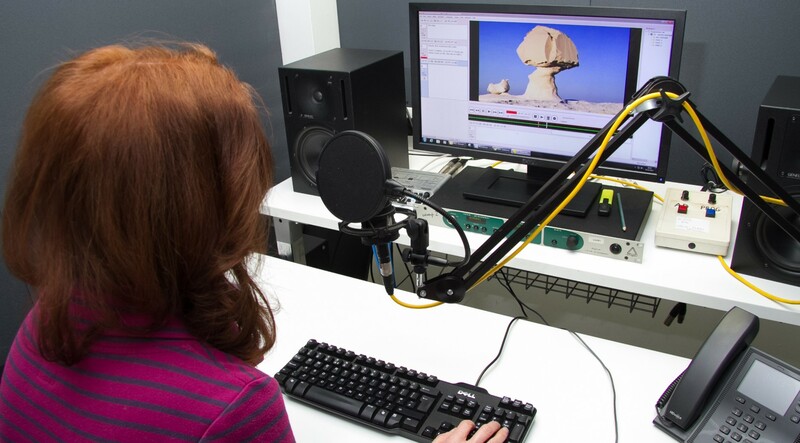 How to become an audio describer? It is a noble profession that requires a lot of patience and resilience. You will work on tight deadlines, and you must be able to think and react quickly especially in a live performance. You must have a good command of your voice’s tonality to convey important elements from the visual aspects. It also helps to have other talents in acting, broadcasting, and voiceover work. Many unions and organizations can train and certify you, one of them is The American Council of the Blind. There is still a lot of work ahead so be prepared. Sometimes, using static text is sufficient especially for talking head videos: It is a method that replaces audio descriptions in some cases and is used for video content that doesn’t require much description especially when it comes to vital information that depends on the time factor. For instance, text captioning is perfect for talking head videos such as a press conference, where one person is speaking with a static background, and there are no crucial visual elements to describe. What is cinema audio description? It’s a fantastic service that theaters offer to people with visual impairment. 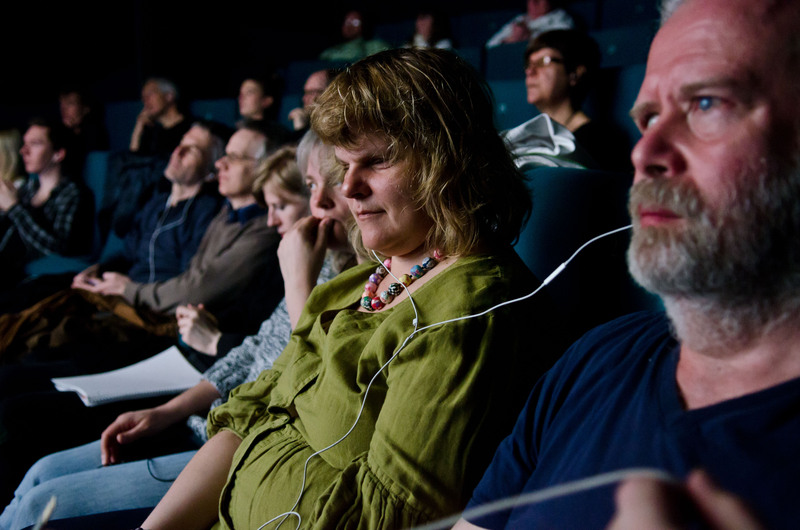 The movie is played with its usual soundtrack while a recorder narrator describes the events on the screen through personal headphones. Many cinemas in the United States, United Kingdom, and Australia are adopting this technology spending hundreds of thousands of dollars on subtitles and audio description. Today, all accessible, new movies have an audio description (source: CreditGlory). However, there is still a huge number of videos without audio descriptions. 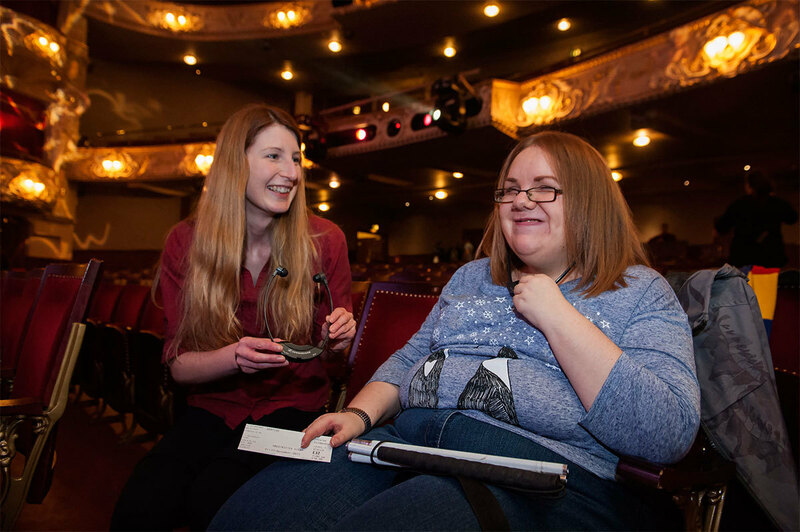 Accessible cinema helps thousands of disabled feel integrated into society. Many disabled people like to go to the cinema to enjoy a movie with their friends and family; it is unfair to deprive them of that right. Before 2000, people with a severe hearing loss couldn’t enjoy cinema except by watching foreign language movies. Visually impaired people didn’t visit theaters altogether. Today, emerging technologies such as subtitle glasses and seat-mounted displays they can enjoy the movies just like everybody else. Now they can enjoy cinema rather than endure it. A secondary soundtrack that the user can select and play on top of the original soundtrack: this method can be implemented in two significant ways. First, and because some devices don’t allow two soundtracks to play at the same time, the audio description is played along the original description, and it contains the descriptions only. Second, with the devices that do allow two soundtracks, the original soundtrack is removed and replaced with a new soundtrack that contains the audio descriptions. Creating original audio descriptions for the movie: It is a method that involves adding the audio description to synchronized media by using a second version of the film where a single track containing the original soundtrack along with the audio descriptions is created. Creating extended audio descriptions for the movie: It is a method that involves a prolonged version of the movie with extended audio descriptions. The problem with audio description is that they have to explain a lot of things in a short time as in between dialogues. In this case, a version of the movie is created with extended audio descriptions and also one more version without the descriptions. Some devices will allow turning the descriptions on and off. Audio description is a technology that enhances the viewing experience of blind or visually impaired people. It helps people with vision problems understand and enjoy visual images, be it in theater, television, movies, and even YouTube. In essence, audio description for blind people is what closed captioning for deaf people. It is a narration service, usually free, to help a blind person view video content as a normally sighted person can. If you were a blind person, it is like having a sighted friend beside you describing what’s going on the screen in details. Audio description can accompany a variety of performances whether in theaters, museums, television, film, or video presentations. The purpose of the video description is to provide the listeners with commentary and narration. Audio description include accurate, neutral descriptions of new scenes, change of scenes, settings, costumes, facial expressions, physical actions, body language, and “visual jokes,” permeating the presentation in a way that doesn’t interfere with the dialogue or soundtracks. What does audio description look like in the real world? According to international standards that regulate publishing audio descriptions, there are several forms of audio descriptions. All of these forms are tested and known to be efficient.